As Britain built an empire that would one day hold sway over a quarter of the world’s land surface, Parliament had to decide how to handle its new indigenous subjects. In an 1837 House of Commons Report, the government posited that the only way forward was imposing assimilation. In Canada, the United States, Australia, and New Zealand, various iterations of the Indian Residential School system were created — usually church­run boarding schools meant to forcibly assimilate indigenous children into Western culture. Attendance was mandatory, and Indian Agents would regularly visit aboriginal communities to take children as young as two or three from their homes. Many of them wouldn’t see their families again for the next decade, others would never reunite again. These students were punished for speaking their native languages or observing any indigenous traditions, routinely physically and sexually assaulted, and in some extreme instances subjected to medical experimentation and sterilization. The removals continued in Australia until the 1970s. The last residential school in Canada didn’t close until 1996. The U.S. government still operates 59 Indian Boarding Schools today. The lasting impact on these indigenous populations is immeasurable and grotesque. Thousands of children died while in the system — so many that it was common for residential schools to have their own cemeteries. In Canada, mass graves are being discovered on a near monthly basis. And those who did survive, deprived of their families and their own cultural identities, became part of a series of lost generations. Languages died out, sacred ceremonies were criminalized and suppressed. The Canadian government has officially termed the residential school system a cultural genocide. The work I’ve shot so far over the past year, based in Canada and the U.S., focuses on the impact of what it means to lose your identity. A disproportionate number of residential school survivors and their immediate family struggle with PTSD, depression, and substance abuse — and this persistent legacy of social and public health consequences needs to be documented and shared. 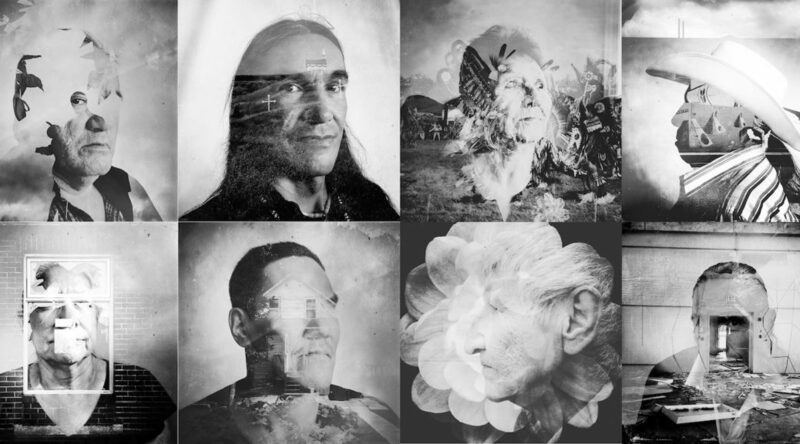 I create multiple exposure portraits of former students still fighting to overcome the memories of their residential school experiences. These individuals are reflected in the sites where those schools once stood, in the government documents that enforced strategic assimilation, in the places where today, native people now struggle to access services that should be available to all Canadians and Americans. These are the echoes of trauma that remain even as the healing process begins. Indigenous history continues to remain a footnote in our history textbooks, and in mainstream reporting. I hope this work will recast the stories that we are used to telling our children — about Pocahontas and Sacagawea and Columbus and Thanksgiving — and highlight the brutal history of cultural genocide.